Milton Kahlor Muehring, 91, of Hannibal, MO passed away at 5:42 p.m. Friday, August 31, 2018, at Willow Care Center in Hannibal. A Celebration of Life Visitation will be held from 6:00 to 8:00 p.m. Tuesday, September 4, 2018, at the Smith Funeral Home & Chapel. Funeral services will be held 10:00 a.m. Wednesday, September 5, 2018, at the Smith Funeral Home & Chapel. Rev. Wayne LaForce and Rev. Jason Young will officiate. Burial with full military honors provided by the Emmette J. Shields American Legion Post No. 55 will be in the Grand View Burial Park. Milton was born on January 19, 1927, in Hannibal, MO the son of John C. and Mildred M. (Ravenscraft) Muehring. Milton was united in marriage to Rebekah C. Forney on June 4, 1944, in Hannibal, MO at the home of Rev. John Golden. Survivors include his wife of seventy-four years Rebekah Muehring of the home; two sons, Jeffrey Muehring and wife Cathy and Steven Muehring and wife Linda all of Hannibal, MO; grandchildren, Paul Muehring and wife Emily, Josh Muehring and fiancé Olivia Mack all of Hannibal, MO, and Jacob and wife Kristen of Fulton, MO and great granddaughter, Maggie May Muehring. In addition to his parents, Mr. Muehring was preceded in death by one brother, John E. Muehring and one sister, Lois Moyers. 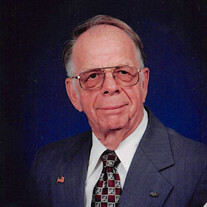 Milton graduated from Hannibal High School in 1944. He proudly served his country in the U.S. Army during WWII as a Staff Sargent. Mr. Muehring worked for the Missouri State Highway Patrol as a Weigh Station Operator and later worked in the Motor Vehicle Inspection division of the MSHP before retiring with over 30 years of service. Milton loved being outdoors. He was known for always having an immaculate lawn along with raising beautiful Roses and flower gardens. Milton also enjoyed raising a large garden every year and sharing his harvest with family and friends. Family was Milton's love, a loving wife of seventy-four years, two loving sons and daughters-in-law, three loving grandchildren and a very special great-granddaughter brought love to Milton's heart. Milton and Rebekah loved helping others and served as members of the Hannibal Regional Hospital Auxiliary. Mr. Muehring loved his Lord and Savior and was a faithful member of the Hannibal First Church of the Nazarene. Serving as pallbearers will be Paul W. Muehring, Joshua E. Muehring, Jacob K. Muehring, Jeffrey Muehring, Steven Muehring and Bob Borgmeyer. Serving as honorary pallbearers will be Harold Elder, Jack Cowden, Dr. James Thornton, Timothy Sanders, Steve Saylor, Rich Adair and John Locke. Memorial contributions may be made to the Hannibal First Church of the Nazarene, in care of the Smith Funeral Home and Chapel.